There are times when memories of days gone by appear as a deluge and carry you back to those times. They come from just about nowhere and linger on. These days it is happening to me quite often. I bask in those moments of pleasure that will probably never come back again. ; not that I repent it. But, yes, certain things of the past do bring in a smile and I cherish those moments as I keep them safely in my mind's treasure chest. While I jot this down, I remember how my mother and grandmother would sun their prized possessions, mainly the pretty brocade and embroidered saris during the September days! They would spread them out with so much fondness, out in the sun and let them soak in the sun and the breeze. And while they would do this,they would embark on their journey of memories. I always enjoyed these moments when I would get to know about those pieces, that they, so lovingly, would sun. Thinking of days gone by,today, is somewhat like sunning my memories before I store them away once again. I guess, we all do that, don't we? 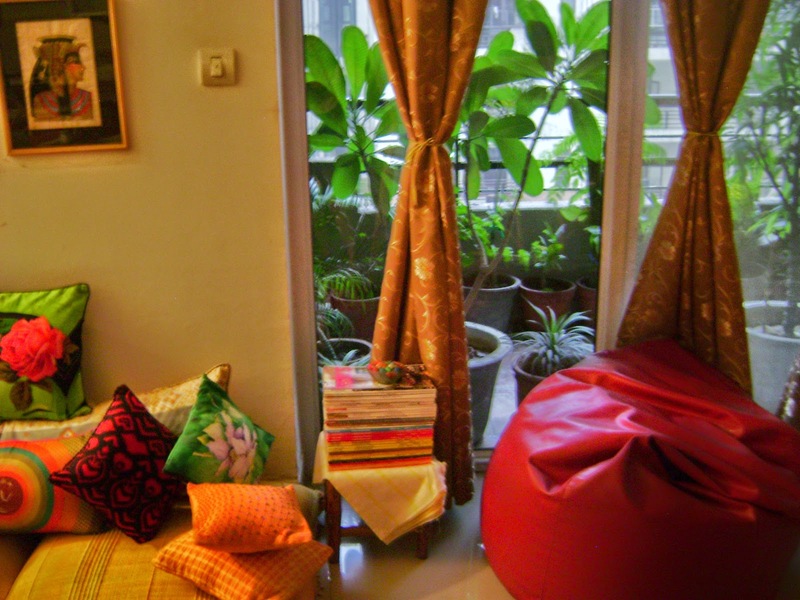 Our home happened to be one of those prized possessions of mine those days. Living in the midst of compulsions, the time spent together with my loved ones,building up a home out of the brick and mortar condominium, up in the northern part of our country, wasn't something we had really wished for. Compulsion was the key word in our lives those days. And the only pleasure we derived was to build up this home, piece by piece; a home that was our comfort, our solace, our buffer from all those depressing moments we were experiencing. So, we set out making this rented place our home. Like all rented accommodation, we did have our share of difficulties. The walls were too white, the woodwork too less, the flooring too dark, the windows too long (they would require meters and meters of cloth for curtains), to name a few. But we took up the challenge and did succeed to some extent. Here are a few shots, a few pieces of that home, we had carved out for ourselves. These are memories now and what better way to store good memories! I love seeing these photographs and every time I see them I remember our good times spent there; the stories of labour, of achievements, of laughter and even failures. Life is not all about warmer days....there are those cold depressing days,too. And during those times the warmth of our nest shielded us, sent across those positive feelings that the sun is soon going to shine again. I would love to hear your stories too. And with a cup of chai, here I am, all ready to indulge in some more nostalgia. So bright and colourful pieces of your past home, Bandana. Home is home, and I am glad that you cherish the memories by these pictures. The dusky evening looks beautiful. A big "sigh" for those lovely green plants, how I wish I could survive them in this cold weather of my part of the world. Thank you so much for those lovely words! And thanks for stopping by :-).... my love for plants makes me gather some of them each time I go to a new place. Memories are so precious! 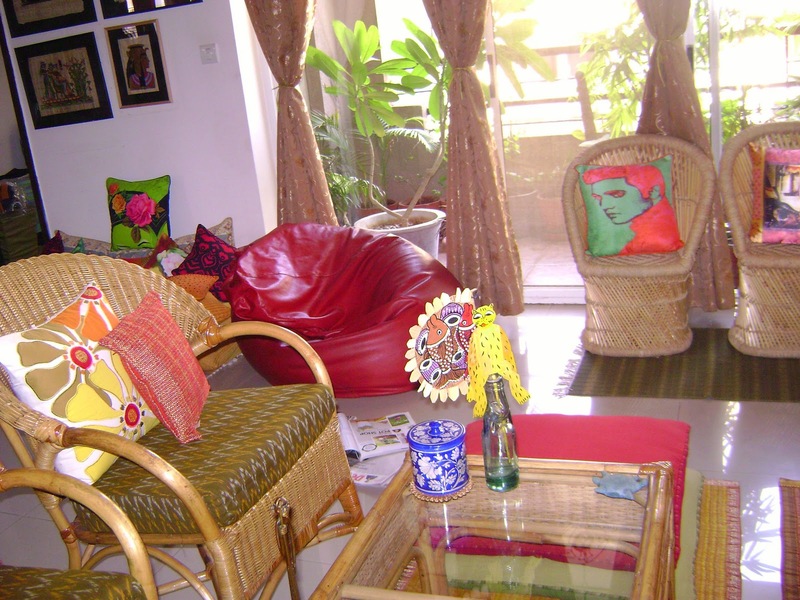 Your home is so bright and colourful.. so vibrant..
And yours was the first blog that had this home of mine :-)....Thank you Patricia for your lovely words of appreciation and for stopping by! 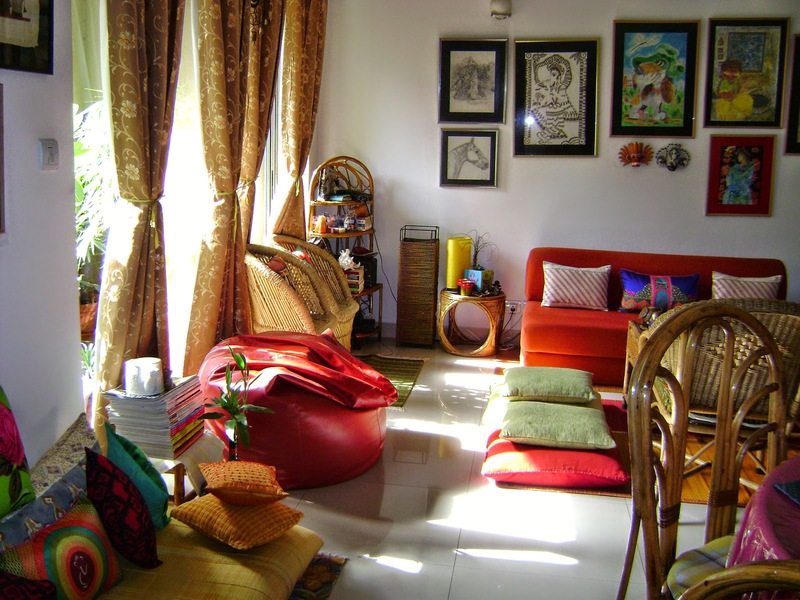 Just love it when the sunlight enters the rooms. Your first picture says it all. I love the first photograph,too! Sunlight can really work wonders.....:-) thank you Haddock! Such a sunshiny room ... love it and thanks for sharing!! !